Parents: DO NOT SIGN the Refusal to Vaccinate form! Here are 12 reasons why no parent can sign this document unless they are interested in being statutorily charged with neglect or intentionally causing harm. 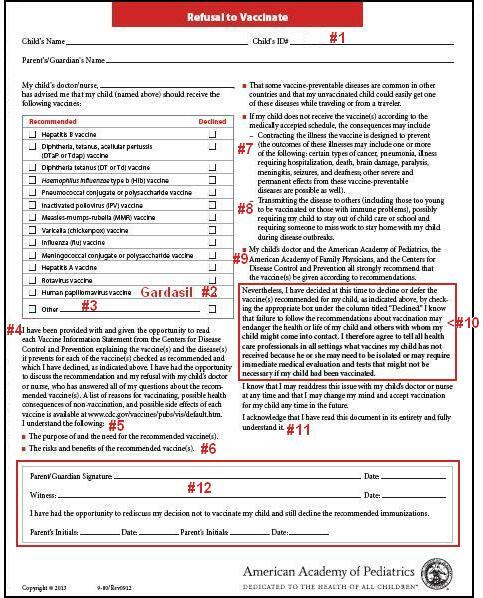 Repeating more boldly: this document, if signed, could be used to have your child(ren) removed from your custody! It was created to stand up in court, which is why they require the parent’s signature to be “witnessed”. The document attaches a child ID # that will be identifiable in the electronic records system across the country. Everyone from the school to the NSA will be able to determine who is and who is not vaccinated. …. We hold these truths to be self-evident, that all people are created equal, that they are endowed by their Creator with certain unalienable Rights, that among these are Life, Liberty and the pursuit of Happiness — That to secure these rights, Governments are instituted among People, deriving their just powers from the consent of the governed — That whenever any Form of Government becomes destructive of these ends, it is the Right of the People to alter or to abolish it, and to institute new Government. Ron Paul: Another False Flag – Will Trump Escalate In Syria?